In fact, I’m pretty sure I remember her coming to my school and making this craft with my class at some point, too. If you’re looking for simple crafts for kids to do this Thanksgiving, here you go…this is *super* easy, requires very little supervision (well, as long as your children are old enough to handle toothpicks), and is (mostly) healthy, too! This is perfect for entertaining the kids before Thanksgiving dinner. I placed the marshmallows, raisins and toothpicks in bowls and gave each kid an apple. 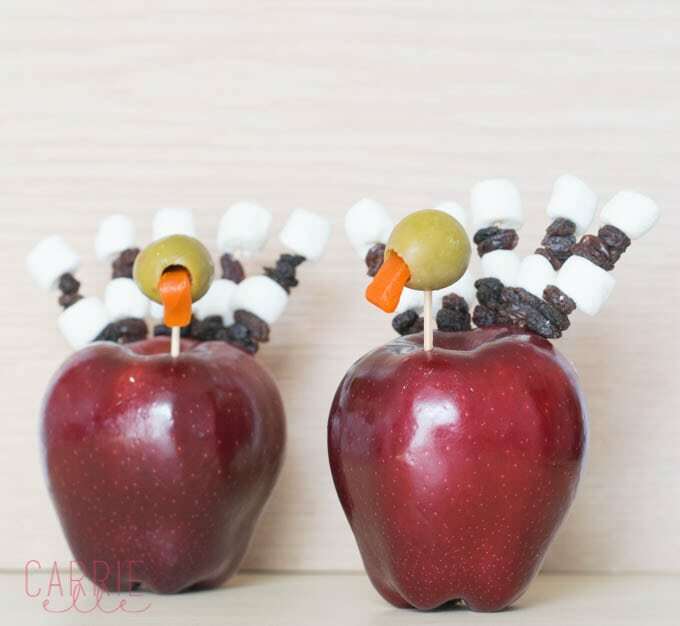 Have them fill the toothpicks with marshmallows and raisins, leaving a little bit of the point uncovered so you can stick it in the apple. The kids were grossed out by the olives (:::SIGH:::), so I did that part for them. I used a toothpick to pull the pimento out just a bit so the turkeys would all have gobblers. We host Thanksgiving every year, and I think I’ll probably let all the kids (there will be a lot!) make these when they’re waiting around for dinner. Do you have any simple crafts for kids that you love to do around Thanksgiving time? « Princess Costumes EVERYWHERE? This DIY Dress-Up Station will Get you Organized! This is TOO CUTE! Love it and I pinned and stumbled of course. I need to come up with these things!! My mom said someone taught her at camp in 1964. lol! How fun! What a good idea to keep the little ones occupied (AKA keep them from tearing up the housing and beating on each other) before dinner. Thanks Angie! I love the little olive heads, too!